As science, technology, engineering and math (STEM) careers gain momentum across Canada, a new program at Ryerson is giving high school students the skills to get ahead. The V4Lab Connections program invites high school students to collaborate with Ryerson students on creative works requiring the use of emerging technologies. Through these collaborations, high school students learn a wide range of technological skills, including coding, prototyping, Photoshop and robotics. The collaborative program was born out of the V4Lab summer program – a two-week summer camp that provides students aged 12 to 16 with the opportunity to learn various digital tools and technologies. Vincent Hui, associate chair of the department of architectural science, and one of the organizers of the V4Lab Connections program, said that after some of his campers mentioned their schools couldn’t afford 3D printers, he wanted to find a way to make programming accessible to high school students throughout the school year. With financial support from a Natural Sciences and Engineering Research Council (NSERC) PromoScience grant, which provides funding to organizations promoting STEM topics among young Canadians, Hui and Nene Brode, founder of the V4Lab, devised a weekly on-campus program. The first session began in late September and ran for four weeks, into October. Hui said he expected about a dozen students to come out, but the program quickly “blew up.” Then, with significant interest from certain schools, Hui and his team decided to bring the instruction to them. Northern Secondary School, located in midtown Toronto, was one of the first schools to participate. Rahul Chopra, the department head of technological education, is a Ryerson architecture alumnus who heard about the program from the university’s DMZ, which he keeps in touch with. Looking for unique and experiential learning opportunities for his students, Chopra jumped at the opportunity to participate. 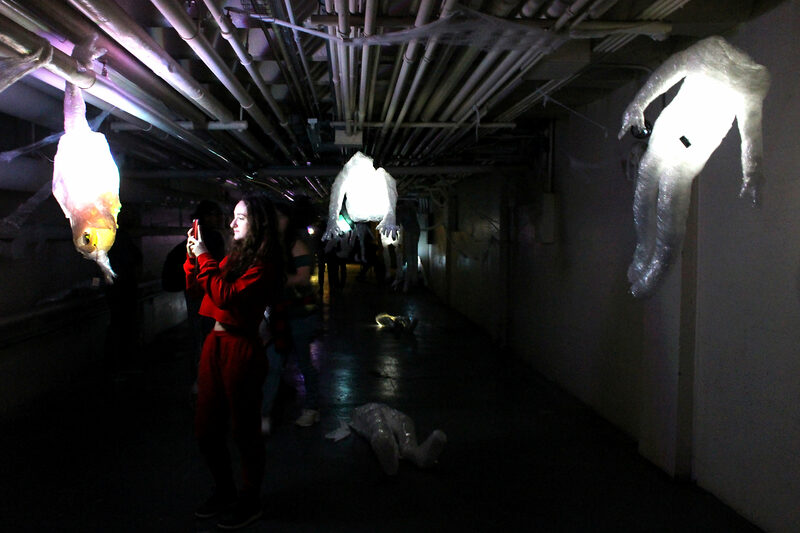 Over three workshops led by Ryerson engineering, computer science and architectural engineering students, Northern students developed responsive installations to hang in the basement of the school throughout Halloween. 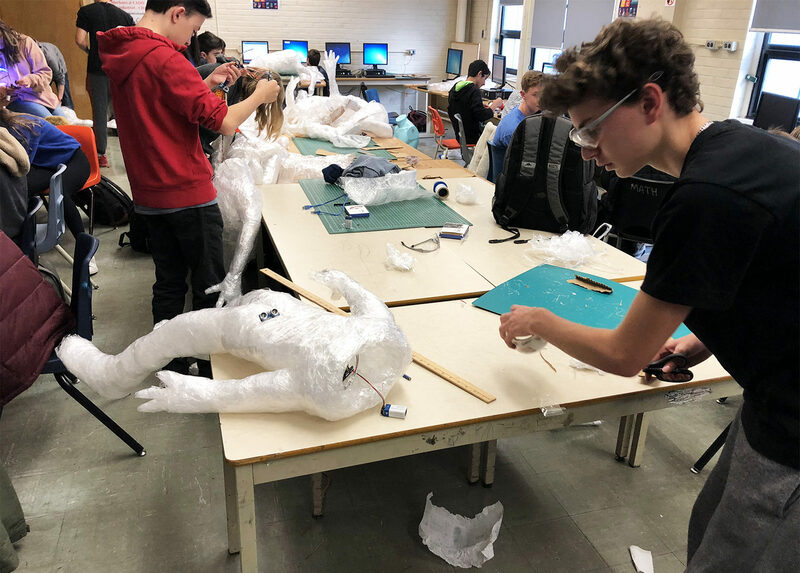 Employing prototyping techniques, students used plastic wrap and packing tape to develop rigid models of themselves in ghost or zombie-like poses. On Monday, students placed sensors and LED lights in their ghost models, which they programmed to change colour in response to their environment. On Tuesday and Wednesday, students and faculty at Northern were invited to see the installations, which were set up to simulate a Stranger Things environment. Chopra said it’s been great to see the students take ownership and pride over their work, adding that the response has been positive. He also notes the importance of the skills students are learning. Kieran Ramnarine, a computer science student and V4Lab administrator, echoes this statement, saying he wishes he would’ve had this opportunity when he was younger. Hui agrees with Ramnarine, and points also to the multiplicity of careers that students can embark on with this greater skillset. Hui said the V4Lab has been successful at pushing this message, and points to resources in the library, including the Collaboratory and the DME, as being catalysts for making this possible. Next, the V4Lab Connections program is planning an alternative design exhibition for early in 2019. They’re also in talks with Northern on a Nuit Blanche-esque installation. Hui said he hopes these initiatives will provide exposure for Ryerson programs, and provide students with future career directions.